Crusade Against Equine Colic’s mission is to save as many horses as possible from deadly and debilitating bouts of equine colic through educating you – the horse men and women who care for them. This four-part series walks you through the keys to understanding and reducing the risks for GI health related colics in horses. In our first post we discussed four common management practices that contribute to poor gut health in horses and could lead to colic: keeping horses in stalls, limiting access to forage, feeding grain, and training and traveling. Even just one of these factors discussed in Know Your Horse’s Risk for Colic may pose a problem for equine gut health. Diarrhea, loss of appetite, weight loss and poor body condition are classic signs of poor digestive health, and may reflect an underlying disease in the horse’s gut – ulcers, colitis, parasites and more. Pawing, sweating profusely, getting up and down, thrashing, refusing to eat and drink, and kicking at the belly are several of the signs of serious digestive distress, usually colic, that requires immediate veterinary attention. However, our goal as equestrians should be helping our horses achieve wellness – not waiting for signs they are in distress and then offering treatment. Start looking for these early warning signs of poor gut health in horses that can signal increased colic risk. Poor coat health. Natural shine and dapples are signals of optimal digestive health. The cannot be truly replicated with any amount of grooming or spray sheens. Sensitive flanks. 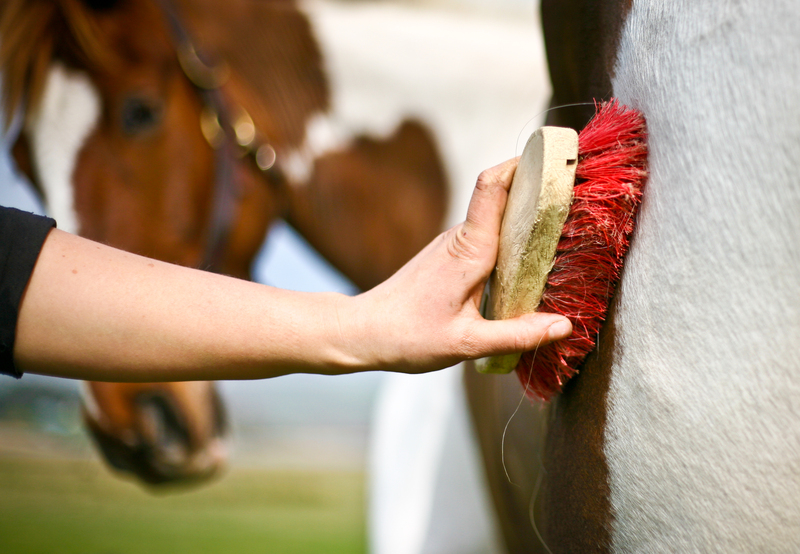 Horses may flinch or react adversely when being brushed along their flanks or to leg pressure when ridden. Lamenesses. Discomfort in the colon can lead to a horse favoring one side. This, in turn, could give rise to fatigue and even injury in the legs and joints. Grain in the manure. Birds picking at your horse’s manure? This is a sign that grain is moving through your horse’s system undigested, which is bad for hindgut health. Intermittent or mild diarrhea. Loose stools always result from a problem in the equine hindgut, and even when mild or intermittent could signal inflammation, digestive imbalance or ulcers. Difficulty maintaining weight. While some horses are naturally hard keepers, difficulty maintaining weight can also result from poor nutrient absorption and gut health. These are all signals that a horse may be suffering from poor gut health, which could increase its risk for colic. Behavioral problems in general, or sudden changes in behavior, can arise for a wide variety of reasons. We tend to assume bad behavior is always a personality or training issue, but it can also be a horse’s way of expressing discomfort – including in its gut.Generally grouchy, unwilling, or even mean behaviors can be a horse’s response to pain or feeling unwell. Additionally, behavioral issues like cribbing and girthiness can be tied directly to poor digestive health. Studies show a direct correlation between cribbing and gastric ulcers; the behavior is thought to provide relief to the irritated stomach. And girthiness may be a response to pressure placed on an unhealthy colon. Keep in mind that poor digestive health may be the cause of behavior problems or sudden changes in behavior. While there is no substitute for patient and proper training and riding, some struggles under saddle may actually be related to health issues. Flat out resistance to seeming laziness may have ties to poor digestive health. Here are some considerations for how gut health and nutrition may impact a horse’s performance. Starch in concentrates may cause sugar highs and lows. Sugar imbalances may cause horses to be high-strung and unpredictable or lazy and lethargic – all in the same day. Digestive discomfort displayed in resistant behaviors. Even mild irritation in the hindgut can induce resistance behaviors in horses. Poor nutrient absorption contributes to lethargy. When a horse isn’t absorbing all the nutrients available in its feed as a result of poor gut health, the resulting deficiencies can manifest under saddle in lethargy and lack of focus. Hindgut dysfunction may cause lack of energy. Imbalances in the hindgut, especially common in horses fed grain-based feeds, impact the horse’s ability to produce volatile fatty acids necessary for energy. Discomfort makes it difficult for horse to perform to full potential. Low-grade inflammation, acidosis, or ulcers in the hindgut cause discomfort which may impact stride length, suppleness, collection, and jumping ability. While performance problems have many potential causes, it’s important to keep in mind that poor digestive health could be a contributing factor. If you recognize some of these health, behavior, or performance problems in your horse, they could be an early warning sign that a digestive problem is brewing. Work with your veterinarian to identify any conditions that require treatment and take steps to promote better digestive health in your horse. And remember that a horse with a healthy, fully functioning digestive system is significantly less likely to suffer from induced colic.